Well, another day down!! Like I said on my facebook, this detox is flying by, but actually I should be saying that I can see my eating habits changing right before my eyes! I slept in again today, I woke up around 8:45 am I think it was. I took my time getting up and around and took my first batch of supplements around 9:00. I loved breakfast today! 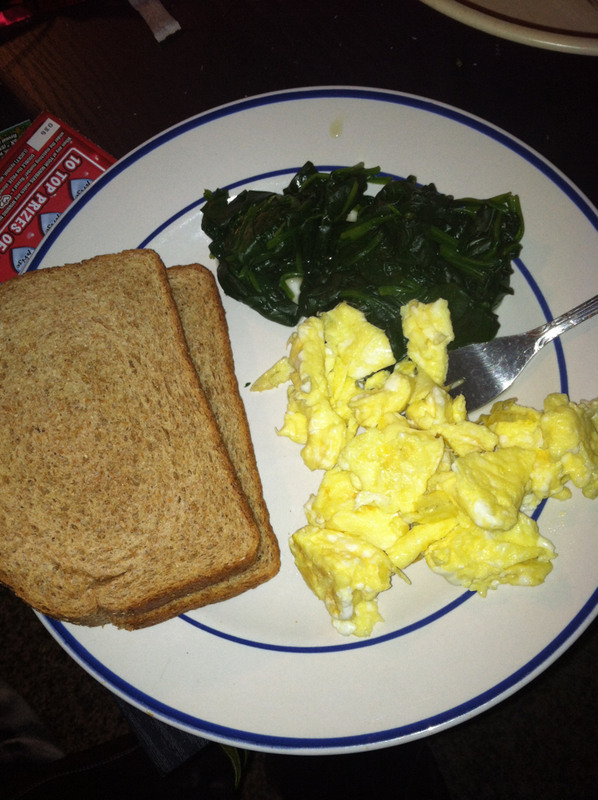 It was the same breakfast I had day one; eggs, toast, and I tried spinach instead of Kale 🙂 The breakfast I think I will be eating for the rest of my life, it is the perfect combination to feel me full, and gives me energy to go throughout the rest of the day until my next meal. I was able to go for about a 30-40 min walk today as well!! It was SOOO COLD! OH MY GOODNESS! I couldn’t feel my legs when I got back into the house! My friend went with me, we were both frozen! But, it is winter in Pennsylvania, what else could I expect!? So then it was time for lunch. I had a microgreen salad and a Lentil Lime salad. 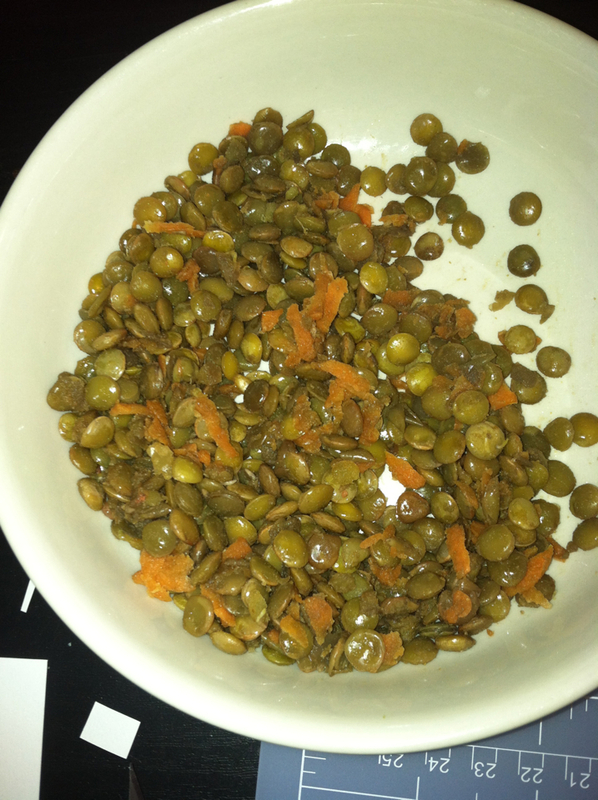 I was unsure what to expect with the Lentils. I have never had them before (that I recall) and I for sure never attempted to cook them before. I had to look it up since I bought the lentils at an organic food store so they didn’t have instructions with them. it wasn’t too hard, just took a little longer than I was expecting to cook them! Now, I was working on a project for one my classes today, so I was kind of stressed because it ended up taking FOREVER to finish! I totally forgot about my snack and didn’t get to eat it until about 6:00 pm 🙁 I had a DELICIOUS apple for my snack. It was SO GOOD! I was craving some of the buffalo chicken dip staring me down… but the apple satisfied me!! I was so happy, because, well… buffalo chicken dip is my FAVORITE!! Well, I am in love with anything buffalo, but that is high up there on the list! Then after waiting 2 hours I was able to have my dinner. Tonight I made sushi. I thought it was going to be a lot harder than it was. The taste was okay, but I am used to spicy shrimp rolls FILLED with flavor! So, this was just a little bit of a shock to have it not be as spicy, but it wasn’t too bad. I didn’t have one of those bamboo rolly things, so I couldn’t roll it very tight. I cut it in half, and then when I tired to cut it again, the one piece fell apart! i decided I wasn’t going to try to be fancy about it, and I would just bit into the two longer pieces, instead of making bite sized pieces. I also had a side of cucumber salad and miso soup. The cucumber salad I LOVED!! It was just enough flavor, but nothing too overpowering. If I could change one thing about it, it would be that i made it fresh and didn’t make it ahead of time. The Miso soup was actually pretty good. I was a little scared because I didn’t have one of the ingredients, and I really hoped that it would still taste okay. So now the super bowl game is over ( I didn’t even know who was playing this year :X) hahahah! I survived and DIDN’T CHEAT!! 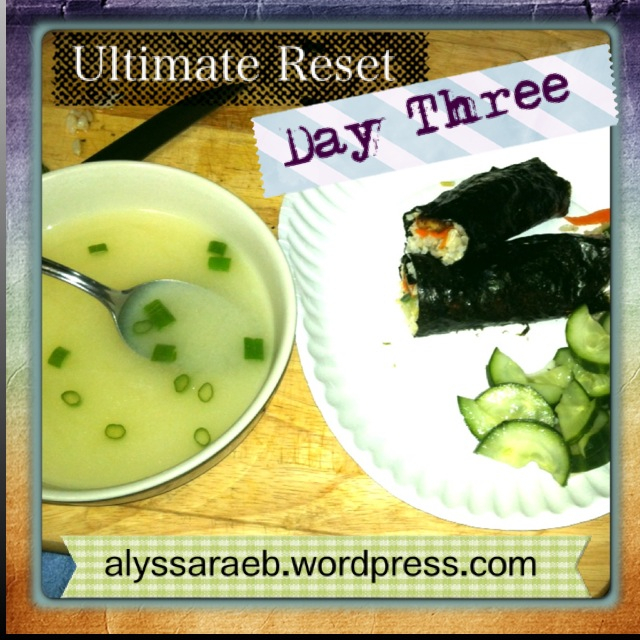 I had so many temptations, but I had my mindset going into the Ultimate Reset, I was not going to cheat, I was going to follow the meal plan carefully, and I was going to stick to the schedule! I have to say I think I am doing a pretty good job. Tomorrow will be the start of the real test. i have classes Monday thur Thursday. It will be a little harder getting meals to fit in, in between classes and work. You will have to stay tuned to see how that goes! It is getting late and I am starting to get a little headache. I don’t know if that is from the detox, or if I am just ready for bed after a long day! I think it may have just been a long day. We will see what tomorrow brings! I stayed at my boyfriends tonight to watch the game so now I have to drive back early in the morning. Have a good night everyone! !